As the Greek federation announced, a letter was received today by FIBA, which asks for sanctions to be imposed to AEK BC because the team will be part of next season’s Eurocup. In the letter, signed by FIBA Europe executive director Kamil Novak, the word sanctions is not mentioned, however FIBA asked a reply from the federation until Monday 4th of July for “the urgent steps” that have to be taken. It’s safe to assume that similar letters have been send to every national federation of each country that has teams in Eurocup. 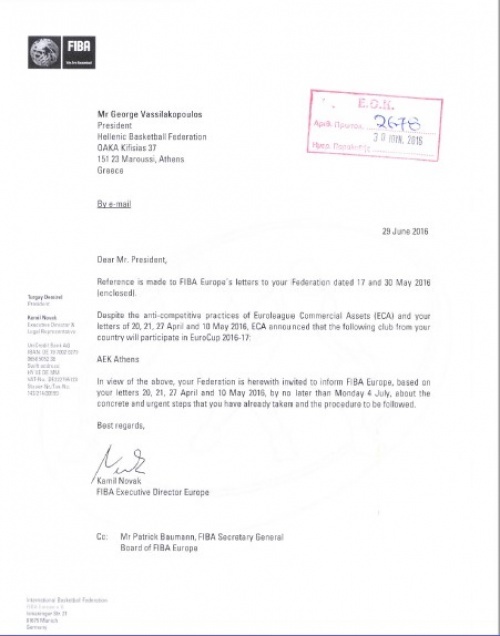 Here’s the letter send to the Greek basketball federation.